Justin Trudeau criticized the Conservative government on Wednesday for decisions around foreign investment that lead to bleak situations like the one U.S. Steel pensioners in Hamilton find themselves in. Justin Trudeau criticized the Conservative government on Wednesday for its decisions around foreign investment that lead to bleak situations like the one U.S. Steel pensioners in Hamilton find themselves in after last Friday's Superior Court decision. Without getting into detail on the government's actions on the U.S. Steel file, Trudeau said income insecurity for retirees across Canada "is extremely concerning to us." 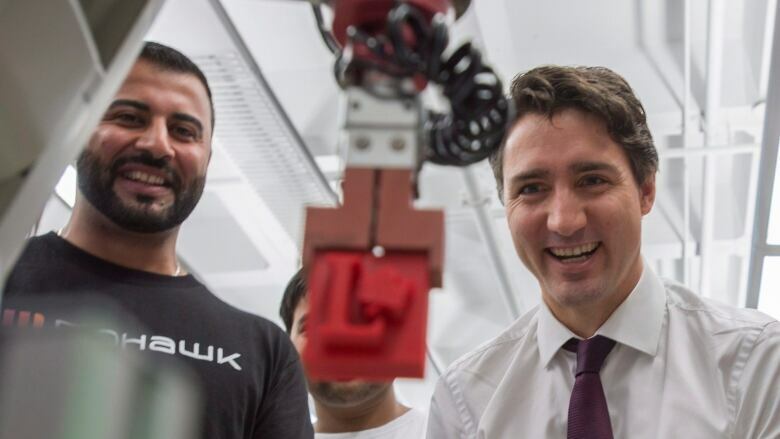 "Unfortunately, we have a government that, over the past years seems to have made decisions around foreign investment based on case-by-case, back-of-the-napkin political concerns rather than what truly is in the best interest of Canadians," he said at a campaign stop at Mohawk College in Hamilton. The Friday decision allowed the American steel maker to sever ties with its Canadian counterpart and let U.S. Steel Canada off the hook for medical benefits for retired workers. About 200 people were at the event at the Mohawk library, many of whom wore red and buttons emblazoned with the names of local liberal candidates. Trudeau talked about investing in co-op placements, youth employment and Canada student loans, earning him applause from the crowd and the college students flanking him onstage. He said a Liberal government would invest $1.3 billion over three years to combat the economic problems young Canadians have. He was joined at the event by local Liberal candidates, including Flamborough-Glanbrook candidate Jennifer Stebbing. In a statement Tuesday, Stebbing slammed her opponent, Conservative incumbent David Sweet, on "his role – or lack thereof – in the Conservative Government's secret agreement with US Steel which has completely failed to protect Canadian workers." Federal Industry Minister James Moore signaled Monday that the Conservative government could sue U.S. Steel over providing benefits to its pensioners. Sweet praised Moore's comments and said he shares "the profound disappointment and anxiety of pensioners and their families." But Stebbing said Sweet, who was chair of the steel caucus, should have done more up front to protect Hamilton workers when the government dropped its lawsuit against U.S. Steel in 2011. "Was Mr. Sweet consulted by the government before this deal was agreed upon? If so, what were his recommendations to the government? If not – why?" she said. "A Liberal government will use all legal tools at its disposal to ensure that U.S. Steel lives up to all of its obligations, whether that be full pension rights/benefits or providing the employment in Hamilton that it promised to do," she said. NDP leader Tom Mulcair has also laid blame for the U.S. Steel situation on Conservative leader Stephen Harper's government. He called the decision Friday "the most recent consequence of an American takeover that the Conservatives rubber-stamped, allowed U.S. Steel to walk away from its commitments to more than 20,000 pensioners and the city of Hamilton." You can follow all of the CBC's coverage from Wednesday's event below.